1Where is your office and show room? Our technical and commercial offices are in Milan, in Via Friuli 63. Our offices are open from Monday to Saturday, according to the following hours: Monday - Friday from 8.30 to 12.30 and from 15.00 to 19.00; Saturday from 9.00 to 13.00. 3Do you carry out inspections and interventions throughout the province of Milan? We are updating, we apologize for the momentary inconvenience. Call us at 02.29522500, toll free 800 310 159, or write us for more information about it. 4Do you carry out your interventions only in Milan or in the rest of Italy? 5How can I book an appointment with you? You can book an appointment at our office for a free consultation, comfortably and in complete autonomy, by clicking here. One of our consultants will be at your disposal. 6How can I request a home inspection? 7Do you have a toll-free number where you can contact you? AirClima has a line with a dedicated toll-free number: 800 310 159. 1Is there any brand for which you do not yet provide an assistance and maintenance service? We can provide a technical assistance and maintenance service for any plant, of any brand. 2Is AirClima a certified company? AirClima is certified ISO 9001. 3Are your technicians certified or have special qualifications? 1What brands are dealt with for direct sales? 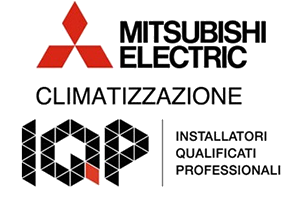 We are IQP - Mitsubishi Electric partner qualified installers, so we mainly deal with this brand. Daikin, Samsung, Sharp, ClimaVeneta, Tecnosystemi are some of the other brands we work with on a daily basis. If you have special needs, contact us. 2I'm not interested in your brands: can you still sell me what I want? Absolutely yes. If you already have a clear idea of what you want, please contact us and we will provide immediate assistance. 3Can you also supply accessories or spare parts for my air conditioner?